The prosecutor of the U.N.-backed tribunal investigating the killing of former Lebanese prime minister Rafik al-Hariri has issued a new indictment adding a fifth name to a list of suspects in the 2005 attack, a Lebanese security source said on Friday. The source said the fifth person was a military member of the militant group Hezbollah and that it is possible that a sixth person, also from Hezbollah, could be added to the list. Last year the prosecutor issued an indictment against four fugitive members of Hezbollah. The Shi'ite Muslim group denies any role in killing Hariri, a billionaire Sunni Muslim politician, and says the suspects will never be handed over to the court near the Hague which it says is politically motivated. The long-running investigation into the killing of Hariri raised sectarian tensions in Lebanon, contributing to the collapse of his son Saad al-Hariri's government a year ago. Warrants for the arrest of the four men were issued in June but Lebanon later told the court it had been unable to track any of them down. The tribunal said last month it would go ahead with a trial in absentia. The suspects were named as Mustafa Amine Badreddine, a senior Hezbollah figure and brother-in-law of slain Hezbollah commander Imad Moughniyeh, as well as Salim Jamil Ayyash, Hussein Hassan Oneissi and Assad Hassan Sabra. 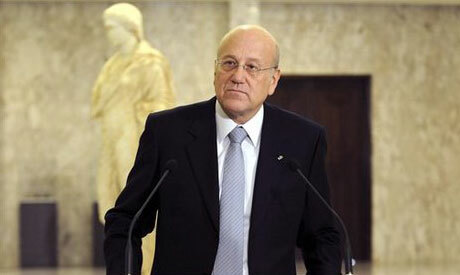 Lebanon's Prime Minister Najib Mikati said two weeks ago he expected a new indictment to be issued by the end of February, when prosecutor Daniel Bellemare was replaced by Canadian jurist Norman Farrell.